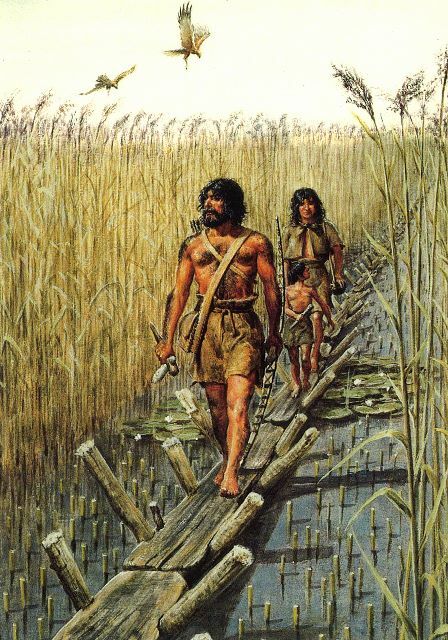 Based on the dry islands of the marshes and the adjoining hills early man exploited the resources of the wetland which lay in-between. This was a changing landscape of open water, reed-swamp, wet woodland and raised bog. However, these wet landscapes were difficult to cross so wooden trackways were built, the most famous of which is the Sweet Track. Fortunately this wet landscape preserved many of these trackways, some of which were found by peat diggers in recent times. The first trackway to be discovered was a corduroy road made of alder logs that linked the islands of Burtle and Westhay. When it was found in 1873 it was named the ‘Abbot’s Way’ as it was thought to have been made on the orders of the Abbot of Glastonbury who had owned the land in the medieval period. In fact, the trackway was built four and a half thousand years ago, over 3,000 years before the first Abbot of Glastonbury was born. Often structures and artefacts were found and reported by the peat cutters. In the 1960s as the rate of peat digging increased so did the extent of discoveries. This led to the Somerset Levels Project being set up in 1973. Directed by John and Bryony Coles, this project managed to excavate and record some 30 or more groups of wooden trackways plus many everyday objects, including what is believed to be a child’s toy! 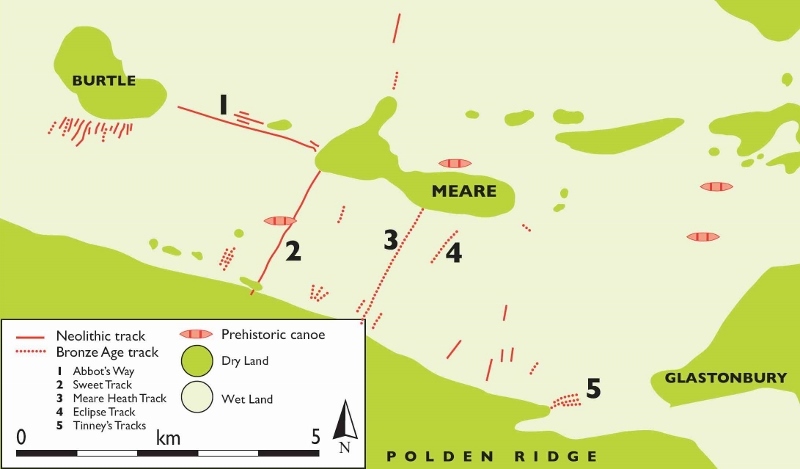 They pioneered many of the techniques of wetland archaeology that are still in use around the world today. To encourage the reporting of finds many of the trackways were named after their discoverer or the peat company or farmer who owned the land, such as the Eclipse, Tinney’s, Baker, Garvin’s and Rowland’s tracks. The most famous of the trackways was the Sweet Track, named after Ray Sweet who discovered it while ditch cleaning. This trackway crossed the 2 km of reed-swamp that separated the island of Westhay from the dry land of the Polden ridge to the south. Tree-ring dating (dendrochronology) has proved that it was built in the spring of 3806 BC when farming and settled life was just beginning in what is called the ‘Neolithic’ period. Fats extracted from pottery found beside the track were from cow’s milk, providing the earliest evidence of dairy farming in the UK. In simple terms the Sweet Track was carefully constructed by driving sharpened poles obliquely into the peat to form a V into which planks were fixed. These planks were then stabilised by driving long pegs through holes in the planks and down into the peat and clay beneath. It also sounds very easy until one remembers that there were no saws or steel axes, just wooden wedges and stone axes! 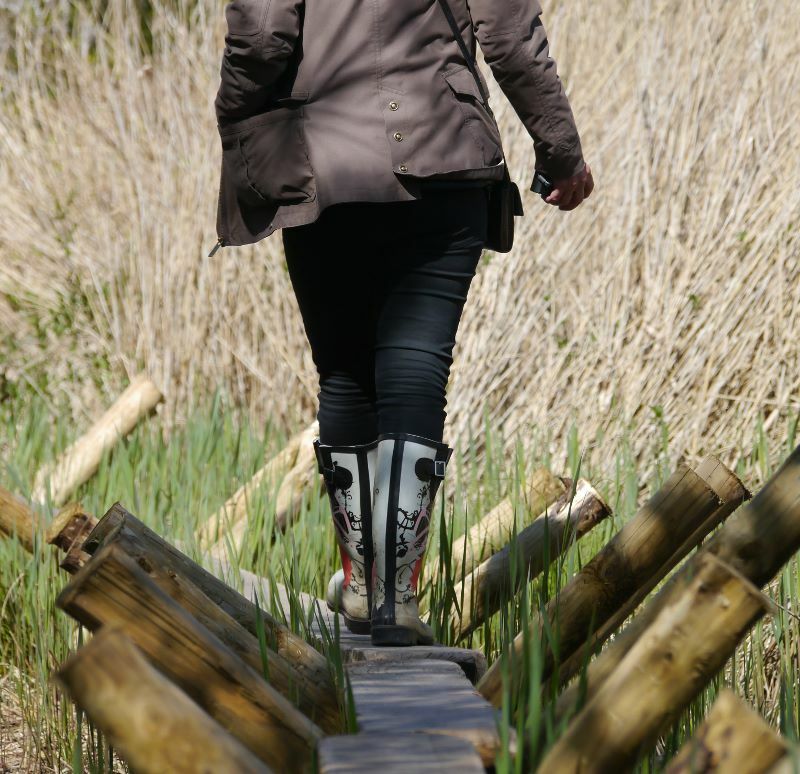 You can see a replica of the Sweet Track, walk along part of its route and imagine what the landscape would have looked like by visiting Shapwick Heath National Nature Reserve. An even earlier trackway, called the Post Track, was built on the same line as the Sweet Track in 3838 BC and is the oldest trackway known from the UK. It may have lasted the 32 years until the Sweet Track was built, but repairs were only made to the latter for less than 10 years, after which it seems to have been abandoned. Other simpler tracks were made of dumps of brushwood laid along the line of the route and pegged in place by small stakes. These were the most common form of trackway built to cross the bog. 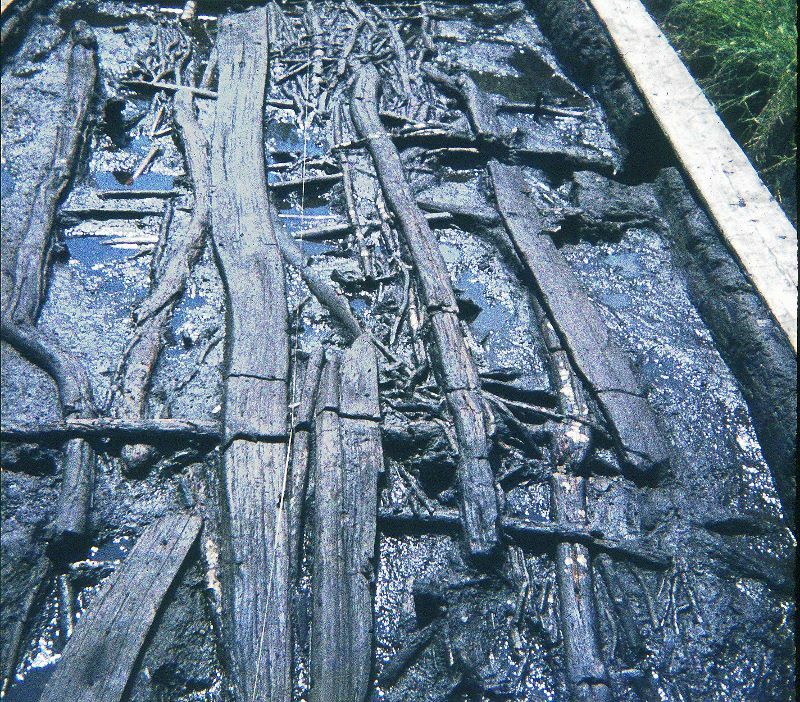 In the later Bronze Age, between 1400BC and 800BC, the raised bog surface became much wetter, possibly as a result of climate change, and more substantial trackways had to be built. The most impressive of these was the Meare Heath Track that was made from large oak planks laid on top of dumps of brushwood and transverse planks that operated like railway sleepers. A replica can be seen at Shapwick Heath National Nature Reserve. 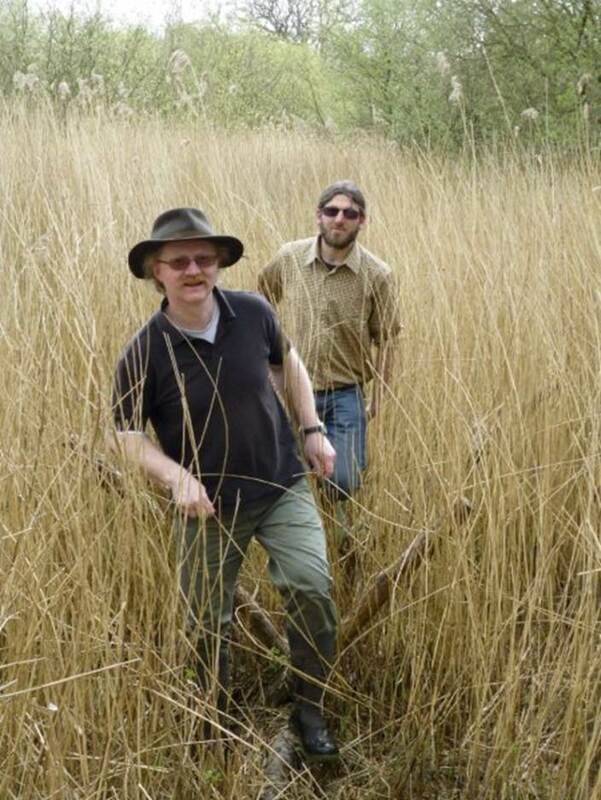 The wetlands had a central role in prehistoric religious beliefs. 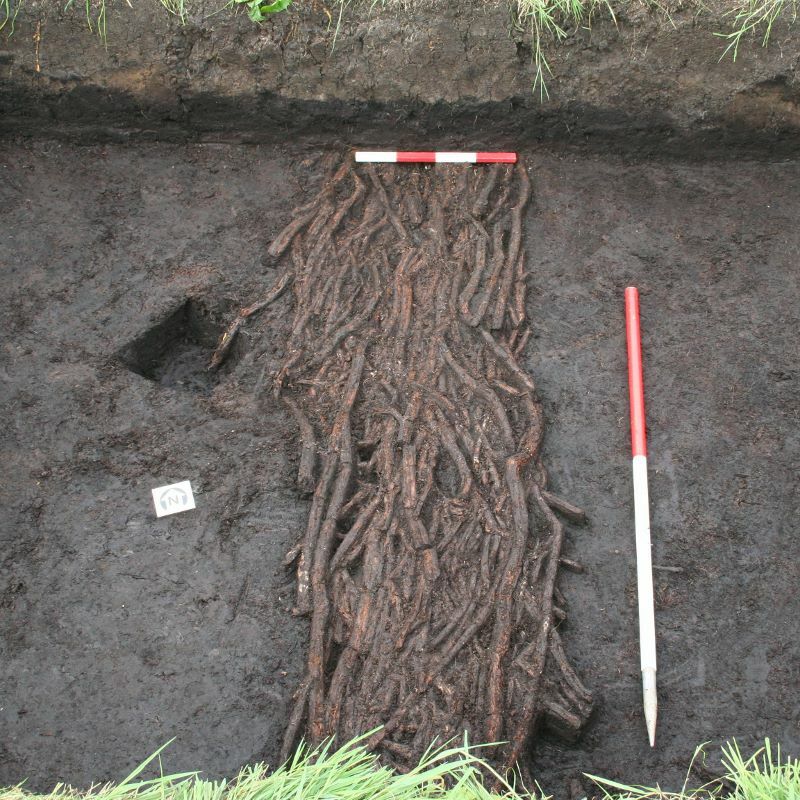 Numerous Neolithic and Bronze Age artefacts have been found in the peat, either as stray finds or beside trackways. Some of these may be the result of accidental loss, such as broken pots full of hazelnuts, but most were probably deliberately deposited as offerings to the gods of the wetlands, such as the hoard of bronze axes discovered near Edington Burtle. Some of these offerings included what were probably the most valuable possessions of those cultures, such as a polished jadeite axe that had come all the way from the French Alps but had never been used before it was deposited beside the Sweet Track. The offerings were usually made in areas of shallow water where they might still be visible for a time before disappearing under the growing peat. Reference made to Sweet Track to Glastonbury by Bryony and John Coles.